There are quite a number of people who find hatchbacks with higher ground clearance and additional body cladding appealing, for the Indian mindset is all for SUVs. A cross-hatchback is nothing but a beefed up hatchback that is sure to appeal to someone who loves a rugged appeal. And with Volkswagen, Toyota and Fiat already in the ring, Hyundai felt the urge to join the battle with the i20 Active, as we further reveal in our Hyundai i20 Active review. 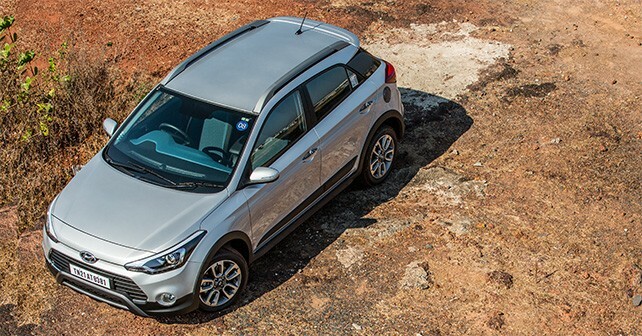 We’re not going to call it an SUV, but the i20 Active does look more rugged than the standard car . At the front, it gets a horizontal grille with a bold faux bull-bar design. Instead of the sleek fog lamps on the i20, the Active gets circular ones with cornering lights. There’s also a lot of body cladding around with skid plates at the front and rear. It comes shod with 16-inch wheels, although we do think they look a bit small. Inside the headlamps, there are LED lights that have been incorporated and look pretty premium. Even the rear remains identical to the Elite i20, except for the slightly revamped bumper and the circular reverse lights. The cabin too, is identical to the i20’s, but the Active gets two-tone, blue and black interiors or Tangerine Orange. Although we would have preferred an all-black theme. But then, Hyundai says the Active’s target audience is the young buyer, hence the vibrant colours. The driver’s seat comes with height adjustment, and we like the aluminium pedals as well. Features include rear AC vents, ABS, chilled glove box, reverse camera, an entertainment system with Bluetooth Connectivity and 8 speakers. Space is aplenty, both – at the front and rear. The Hyundai i20 Active is powered by two engine options: a 1.4 U2 CRDi diesel engine that makes 89bhp and 220Nm of torque and is paired to a 6-speed manual gearbox, and a 1.2-litre Kappa VTVT petrol engine that produces 82bhp and 114Nm of torque is synced with a 5-speed manual transmission. 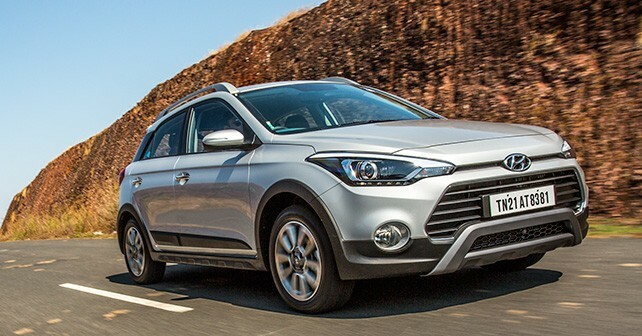 We drove the one with the diesel engine for our i20 Active review. Power delivery is linear, and the engine appeared to be more responsive than before. Over rough roads, the ride is pliant. Around corners, the Active felt planted and there’s very little body roll. Priced between ₹ 7.07 lakh – ₹ 10.09 lakh, the i20 makes a funky statement for itself, while also looking properly rugged. There is no compromise on ride quality, and the car comes equipped with all the necessary features, a spacious cabin and of course, two good engines. It’s really up to you to decide whether it’s the regular i20 or the cross version that piques your interest the most. Do look out for our in-depth Hyundai i20 Active review to find out more.